Are you a coffee lover? A tea lover? Somewhere in between? If your answer is "yes" to any of these questions, then cascara may be the drink for you. Cascara, which I only recently heard about, is the dried skins of coffee cherries, the fruit that surrounds coffee beans, which are actually seeds. Cascara (or "coffee-cherry tea") has been consumed for generations in coffee-growing countries, but the market for it is just starting to develop here in the States. In Chicago, you can purchase cascara from some of the city's finest independent roasters. I found bags from PassionHouse and HalfWit--although there may be others. Some local shops are starting to use cascara in their seasonal signature drinks, so ask your neighborhood barista about this naturally sweet, refreshing nectar. Cascara doesn't taste anything like coffee--even though it's made from part of a coffee plant--but it's not what you might expect from an herbal tea, either. 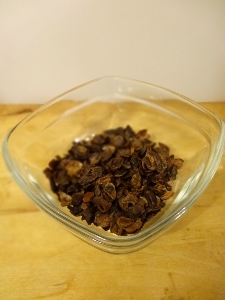 The pieces of cascara are relatively large, and they smell earthy and not unlike raisins--which isn't a surprise, given the "dried fruit" aspect of both. In fact, the tea itself has a hint of raisin, with a bit of tartness and spice. Wondering about caffeine? Cascara has about one-third of the caffeine as a cup of coffee. The other neat thing about cascara is that it's environmentally friendly. Cascara is usually considered a "waste product" of processing coffee. This beverage allows us to enjoy and appreciate a part of the coffee plant that is usually composted or thrown away--not to mention the fact that it provides an additional revenue stream for coffee producers who are at the mercy of the whims of mother nature. Boil the water. Pour water over cascara. Steep for 3 minutes, then strain. Enjoy alone or with milk or sugar.